Apart from creating designs for Herman Miller and John Deere, Girard won the commission to completely redesign Braniff International Airways’ visual identity in the mid-1960s. The collaboration marked “the end of the plain plane” as Girard made over 17,500 design changes, ranging from Braniff’s logo to the design of the airport lounges. The airline company even commissioned the creative pattern designer Emilio Pucci for their new crew uniform. The Braniff Airways Model 66310 armchair was designed to have a low profile to accommodate the low-ceilinged spaces found in Braniff airport lounges. The curved silhouette of the chair feels aerodynamic, possibly suggest the speed and efficiency of the Braniff fleet. 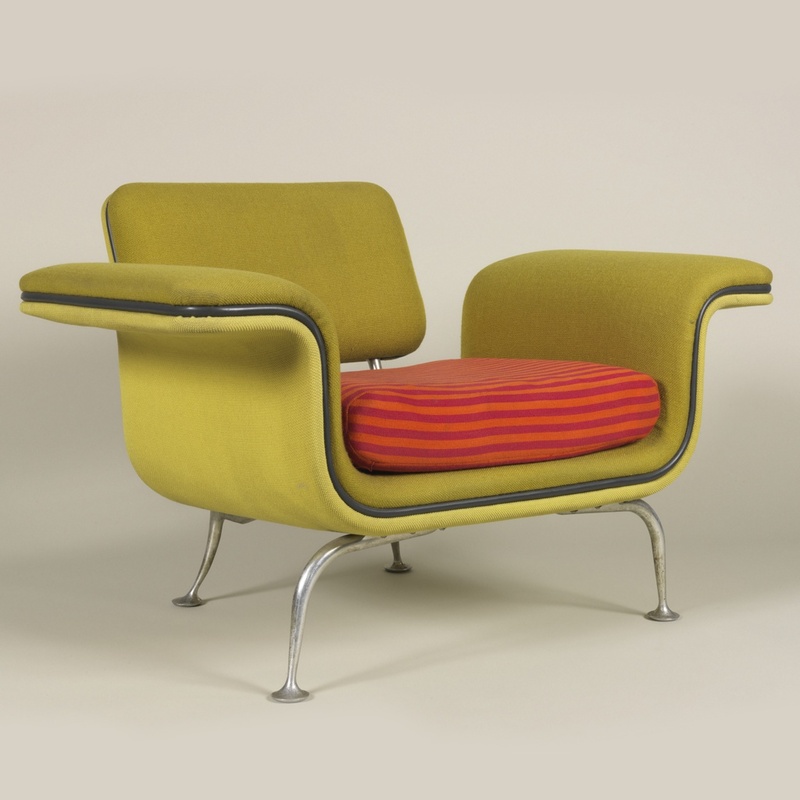 Girard’s bright use of color in the upholstered seat and back is juxtaposed against the horizontal striped seat cushion, all anchored by the aluminum frame. The armchair is a great example of Alexander Girard’s design aesthetic and his exceptional skill of incorporating playfulness into everyday life, even in the most mundane settings. Roshy Vultaggio is a graduate student in the History of Design and Curatorial Studies program offered jointly by the Parsons School of Design and Cooper Hewitt, Smithsonian Design Museum. She is a Fellow in the museum’s Product Design and Decorative Arts Department. Jack Lenor Larsen, “Alexander Girard,” Design Quarterly, No. 98/99., Nelson, Eames, Girard, Propst: The Design Process at Herman Miller (1975): 31. “Front Matter.” American Bar Association Journal 52, no. 9 (1966): 801. “Front Matter.” American Bar Association Journal 52, no. 9 (1966): 801.Jack Lenor Larsen. “Alexander Girard.” Design Quarterly, no. 98/99 (1975): 30-39. The Braniff Airways Model 66310 armchair is on display in Energizing the Everyday: Gifts from the George R. Kravis II Collection, on view from April 27, 2016 through March 12, 2017.